If you have an e-commerce website, then you are more than likely looking for insight into the human psyche to determine what, exactly, drives people to make a purchase when they visit your website. What do your customers look for in an online e-commerce website? What can you do to help increase your conversion rates—to turn a view into a sale? The first step is understanding what matters to online shoppers. One of the most important things to understand when creating an e-commerce website or when attempting to increase conversion rates of your existing website is what truly matters to your customers. Everything from the product you are selling to the ease of navigation and the colors that you use on your e-commerce website can affect your ability to convert visitors into customers. 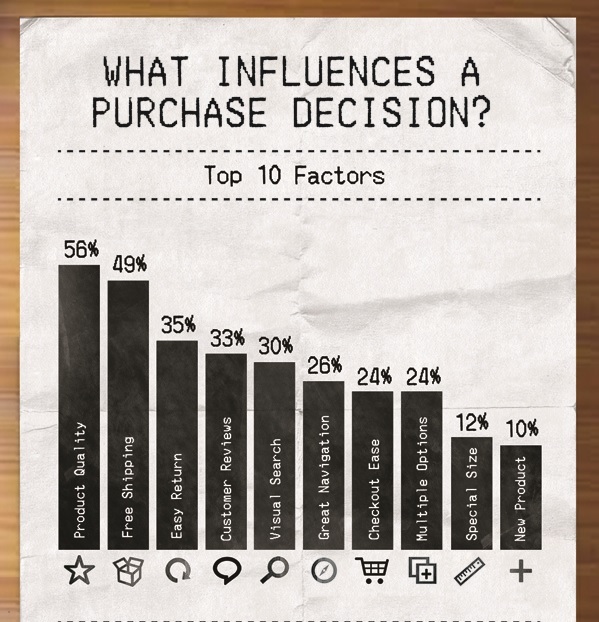 However, 56% of people say the product quality is the leading factor when making a purchasing decision. Therefore, it is essential to understand that you cannot simply create an e-commerce website with all the right features and be successful, unless you have a high-quality product. At the same time, your website plays a key role in getting that high-quality product into the hands of more customers. In addition to product quality, online shoppers care about free shipping, the ease of returns, customer reviews, virtual search options, and a variety of other factors. The infographic below has the top 10 factors. When marketing to your customers, it is also essential for you to understand how colors can be used to communicate different messages to your audience. 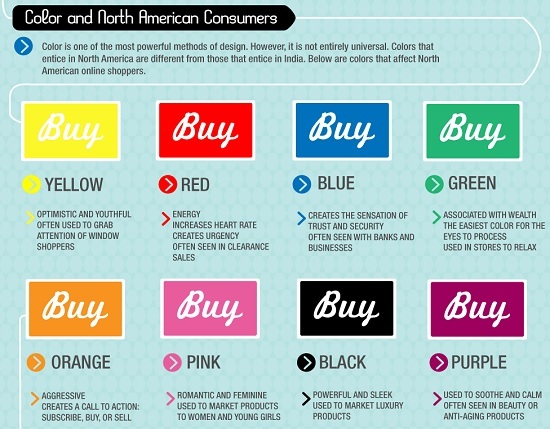 The infographic below has some great information on some of the ways to use color in your e-commerce website to best meet your needs. In addition to ensuring you have a high-quality product and that you are effectively utilizing colors to communicate clearly with visitors, an effective e-commerce website has a user-friendly navigation from the home page all the way to checkout. It is essential that viewers can quickly make purchases with ease—and without frustration. Similarly, the use of pictures and videos is a great way to better communicate product details and features in a manner that encourages visitors to learn more about your products and make the purchase. At the end of the day, you should learn more about your target audience and what they look for in an e-commerce website. Utilize the information you learn about your specific audience in addition to the 10 factors for all online shoppers, to optimize your e-commerce website for conversion.